What It’s About: Dr. Sidney Schaefer (James Coburn) is surprised and honored to be chosen to be the President’s analyst…that is, until the pressure of constant surveillance and intrigue leads him to go on the lam. Spies from every nation in the world are soon in hot pursuit. Why Watch it Today? : One of the most infamous monopolies in American history, that of “Ma” Bell, ended today in 1984 as part of the settlement of an anti-trust suit. The Phone Company plays a major role in today’s film, a testament to a time when it was ubiquitous and powerful. 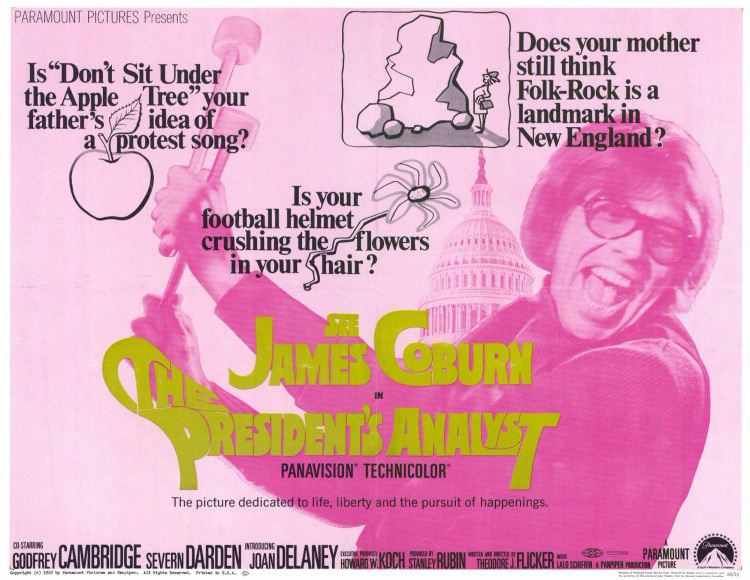 The President’s Analyst is a solid spoof of both espionage films and the politics of the 60s, with an excellent supporting cast led by Godfrey Cambridge and Severn Darden as the American and Soviet agents trying to bring Shaefer in from the cold. This entry was posted in Comedy, Espionage, Fish-Out-of-Water, Movie of the Day, Satire, Spoof and tagged Arte Johnson, Barry McGuire, CIA, Dyanne Thorne, Godfrey Cambridge, Hank Worden, hippies, James Coburn, KGB, kidnapping, Lalo Schifrin, mastermind, musical interlude, New York City, Pat Harrington Jr., President of the United States, psychologist, Severn Dardin, Soon-Tek Oh, Soviet Union, spies, telephone, telephone company, Washington D.C., Will Geer, William Daniels.